Here you will find the latest information from the Legume Virus Project. This includes up-to-date summaries of the data we have on aphids, virus symptoms and incidence during the season in the Palouse Region and announcements of project presentations and other events. We invite you to report your own observations concerning legume viruses and aphids in the Palouse region directly to us. We will incorporate these into our regular installments of Latest News. Send an email with your information to Sanford Eigenbrode. Aphid traps were checked for the last time of the season this week and pulled out of the field. Aphid counts have continued to decrease over the past few weeks with this week showing the lowest count at each trap site all season. All but one sites yielded single digit aphid counts. Virus results will continue to be updated to Aphid Tracker. This week, all traps were sampled and aphids were captured at all sites. Aphid counts continue to drop as plants at most locations start to dry down. Plant tissue samples were taken this week and will be mailed to the Parma lab for virus testing. This week, all traps were sampled and aphids were captured at all sites. Aphid counts appear to be dropping a little bit as plants are starting to dry down as well. Plant tissue samples will be taken next week. This week, all traps were sampled and aphids were captured at all sites. We're still seeing a very large amount of aphids being captured in the pan traps. Still waiting on virus results. This week, all traps were sampled and aphids were captured at all sites. This week yielded the largest amount of aphids trapped so far. Samples will be shipped to Parma for virus testing. We are still waiting of virus results from two weeks ago and last week. Last week (6/11/18-6/15/18) the Entomological Society of America Pacific Branch meeting took place so traps were not sampled until Thursday: Aphids were found at all locations with the most aphids found at site #7. This week, aphids were found once again at all locations with the most aphids found at site #4. Aphids from both this week and last week were mailed to the Parma research lab yesterday to be tested for virus. Virus results from two weeks ago are in: 1 aphid tested positive for virus from site #4 (PEMV), 1 aphid from site #5 (PEMV), 1 aphid from site #7 (PEMV), and 2 aphids from site #8 (PEMV). This week all aphid trap locations were sampled. Aphids were collected at all locations with the most aphids coming from sites 8 with twenty-three and site 9 with twenty-five aphids collected. Aphids will be tested for virus. We are currently still waiting on virus results from the aphids collected last week. This week, all aphid trap locations, including the 5 new spring pea locations were sampled. Aphids were collected at all locations with the most aphids coming from sites 2 and 4 with thirty-six aphids collected from each location. Aphids will be tested for virus. This year is showing many more aphids at this point in the spring compared to last year. The aphids captured last week all tested negative for virus. This week: two aphids collected at site #1, six aphids at site #2, four aphids at site #3, and six aphids at site #4. The virus results are already in for the aphids captured this week and two aphids from site #2 and two aphids from site #3 tested positive for PEMV. Spring pea fields were also added this week (round markers on the map) and will be checked for the first time next week. The aphids captured last week all tested negative for virus. This week: 1 aphid was collected at site #1, 5 aphids at site #2, 4 aphids at site #3, and 2 aphids at site #4. They have been shipped to Parma to be tested for virus. Spring pea map locations should be posted next week. The four winter pea locations were collected this week. Seven aphids were collected at site #3 and one aphid was collected at site #4. They have been sent to Parma to test for virus. The four winter pea locations were collected this week. No pea aphids were collected. The four winter pea locations were collected for the first time this week. One pea aphid was collected at site #2. It will be sent to Parma to be tested for virus. Spring pea locations coming soon. Yesterday and today aphid traps were placed at the four winter pea locations and will be checked for the first time next week. Spring pea locations have not been determined yet. Traps were checked one last time last week and were pulled out of the field for winter. No aphids were collected. Plant tissue samples were collected from each of the four locations and will be shipped to Parma this week to be tested for virus. Traps were checked this week. No aphids were found. Results are back from the aphids captured last week and both aphids tested negative for virus. Traps were checked this week. One aphid was found at site #1 and one aphid was found at site #3. These samples were sent to Parma for virus testing. The 2018 field season is under way. We have four winter pea fields this year, and all traps have been put out and will remain out until the first hard freeze. Traps were placed at sites #1 and #2 this week. Traps were placed at site #4 last week and were checked for the first time this week; no aphids were collected. Traps were placed at site #3 two weeks ago and were checked last week and this week; no aphids were found. Virus results are in from the week of July 19th: PEMV was found at sites #1, #2, #3, #4, #6, #8, #9, and #12. Virus results are also in from the week of July 26th: PEMV was found at sites #1, #3, and #4. Virus results are in from sampling two weeks ago: PEMV was found at sites #1, #2, #3, #5, #6, #8, #10, #12, and #13. This week, two aphids were collected at site #1, one aphid was collected at site #2, two aphids were collected at site #3, two aphids were collected at site #4, two aphids were collected at site #6, and one aphid was collected at site #11. Traps were pulled from the fields this week so there will be no more sampling the rest of the season. We will be awaiting virus results from last week's collection and this week's. Virus results are in from sampling two weeks ago: PEMV was found at sites #1, #4, #7, #9, and #11. This week three aphids were collected at site #1, five aphids were collected at site #2, two aphids were collected at site #3, one aphid was collected at site #4, two aphids were collected at site #5, three aphids were collected at site #6, no aphids at site #7, one aphid at site #8, fourteen aphids at site #9, sixteen aphids at site #10, one aphid at site #11, two aphids at site #12, and no aphids at site #13. All locations were sampled this week. Plant tissue samples were also taken from each location to be tested for virus as well. Collection results for this week: three aphids at site #1, thirteen aphids at site #2, four aphids at site #3, four aphids at site #4, one aphids at site #5, three aphids at site #6, no aphids at site #7, five aphids at site #8, fourteen aphids at site #9, thirty-seven aphids at site #10, no aphids at site #11, two aphids at site #12, and twenty-one aphids from site #13. We are still waiting on virus results from last week and two weeks ago. Virus results are in from sampling two weeks ago: BLRV and PEMV were found at site #12 and PEMV was found at site #11. Because last week's collection was so large, we are still waiting on virus results. For this week: seven aphids were collected at site #1, thirty-one aphids at site #2, two aphids at site #3, nine aphids at site #4, four aphids at site #5, three aphids at site #6, four aphids at site #7, three aphids at site #8, eighteen aphids at site #9, fifty-six aphids at site #10, twenty-two aphids at site #11, three aphids at site #12, and one hundred-thirty-one aphids at site #13. This week all four winter pea fields were sampled: three aphids at site #1, three aphids at site #2, thirteen aphids at site #3, six aphids at site #4. All spring pea fields were sampled as well: one aphid at site #5, six aphids at site #6, one aphid at site #7, four aphids at site #8, three aphids at site #9, twenty-three aphids at site #10, ten aphids at site #11, six aphids at site #12, and 56 aphids at site #13. We are still waiting on the virus results from last week, as there were a lot of aphids trapped last week so a lot of aphids to process. The results are in from the aphids collected last week. One aphid from site #5 tested positive for PEMV. Three aphids from site #7 tested positive for PEMV. Two aphids from site #8 tested positive for PEMV. One aphid from site #10 tested positive for PEMV. This week was another heavy week for collecting aphids. For the winter pea sites: six pea aphids were collected at site #2, two aphids were collected at site #3, and seven pea aphids were collected at site #4. In the spring peas: two aphids were collected at site #5, seven pea aphids were collected at site #8, twenty-five aphids were collected at site #9, ninety-four aphids were collected at site #10, ten aphids were collected at site #11, twelve aphids were collected at site #12, and nine aphids were collected at site #13. These samples will be sent to Parma to test for virus. This week was the first week for collecting in spring pea fields. The spring pea fields have been added to the map as locations 5-13. Two aphids were collected at site #5, three aphids were collected at site #7, five aphids were collected at site #8, three aphids were collected at site #9, four aphids were collected at site #10, twenty-two aphids were collected at site #11, and twenty-one aphids were collected at site #13. For the winter pea fields, three aphids were collected at site #3 and two aphids were collected at site #4. This week no pea aphids were collected at any of the winter pea sites. As for the aphids collected last week, all tested positive for PEMV except one and none tested positive for BLRV. Traps were placed in spring pea fields this week as well. Six fields near Uniontown/Colton, WA and three fields near Fairfield, WA. These traps will be checked for the first time next week. This week, five pea aphids were collected at site 2 and three pea aphids were collected at site four. These aphids will be sent to Parma to test for virus. The single pea aphid collected at site three last week tested positive for Pea Enation Mosaic Virus. This week, one aphid was collected at site three and once again, it tested positive for PEMV. Another aphid was collected this week at site four; it did not test positive for virus. The 4 winter pea field traps were checked again this week. One pea aphid was collected at site 3, This aphid will be sent to Parma to test for virus. Plant tissue samples were also collected this week from all four spring pea locations as well as from a location in Ferdinand, Idaho; Lind, Washington; and Dayton, Washingtion. The tissue samples will also be sent to Parma to test for virus. Spring pea fields should be added soon. The 4 winter pea field traps were checked again this week. No aphids were collected. Spring pea fields should be added soon. The 4 winter pea field traps were checked again this week. No aphids were collected. Last week and this week (April 12 & 19), traps were checked and no aphids were found. Traps are still only in four winter pea fields. Today was the second week of checking traps. Still only 4 winter pea fields have traps in them. No aphids were collected. Today was the first collection day of the spring season. Traps are only out in four winter pea fields right now. No aphids were collected today. More winter pea locations will be added. And Spring pea locations will be added soon as well. All traps were sampled one last time and pulled from the fields for the winter. No aphids were found. Plant tissue samples were collected from each location to be tested for virus and are awaiting results now. Aphid traps were sampled this week and no aphids were found at any of the locations. All five traps were sampled this week, including the two new locations where traps were placed last week. No pea aphids were found at any of the locations. New traps were set out at two more locations this week and will be tested for aphids for the first time next week. As for the other traps, no aphids were gathered at any of the three original locations this week. Aphids were collected this afternoon. 3 pea aphids were collected at Site #2 and these were the only aphids collected. These aphids will be sent south for PCR testing. Today was the first day of the 2017 field season for Aphid Tracker (fall-sown peas). 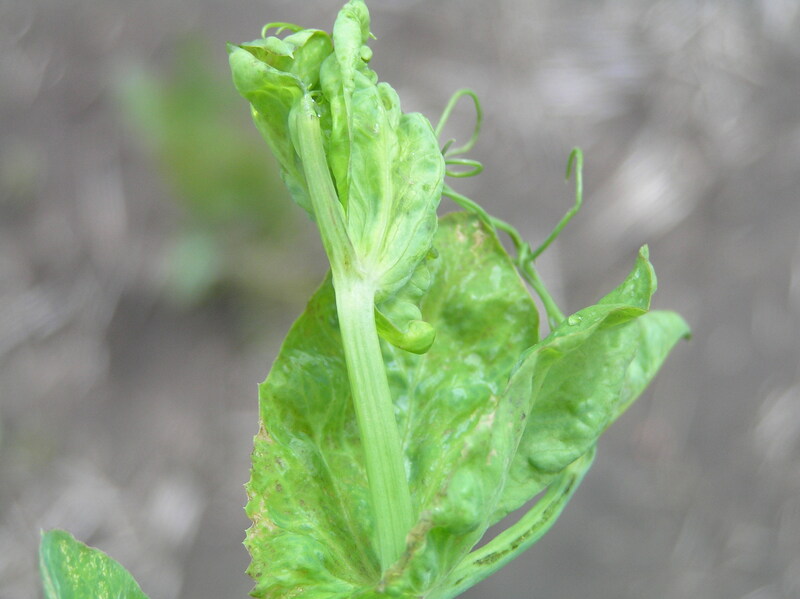 We have only three sites of winter peas and no pea aphids were found in the traps located at any of the three sites. Today was the last day of the 2016 field season for Aphid Tracker. We only collected a total of 2 alate pea aphids at two sites (#2 and #13). A short paragraph or two will be uploaded next week informing you of what we found for this season. The final two aphids will be sent south for PCR virus testing. Aphids were collected early this morning and into the early afternoon. Less aphids were found at sites, a total of 11 alate pea aphids were collected. Site #17 had the highest number of pea aphids (5 total). We have noticed from PCR testing that more aphids have been positive for BLRV than earlier in the season. Again virus symptoms should have a negligible impact on yield (if infected this late in the season). Aphids were collected early this morning and into this afternoon. A bit more than last week (especially considering the storm front we just got). Site #'s with aphids included: 1, 2, 5, 6, 7, 8, 9, 10 and 13. The site with the highest number of aphids was site number 9 with a total of 9 alate pea aphids. Aphids will be sent south for PCR virus testing. Aphids were collected early this morning and into the afternoon. Not too many alate pea aphids were found this week with only a total of 16 aphids at 8 sites (site #'s: 1, 5, 6, 9, 13, 14, 15 and 17). Site #1 had the most pea aphids with 4. Virus was visually evident in fields in the southwest corner of the Aphid Tracker Pan Trap Network. Aphids were collected this morning and early afternoon at 13 sites, we also did sweep net sampling at 13 of the pan trap sites (25 - 180° sweeps/site). Aphids were found in abundance (trap counts) at site #'s: 1 (4 aphids), 6 (5 aphids), 9 (6 aphids). Sweepnet sampling shows that two sites had much higher than normal aphid numbers and are at or exceeding the economic injury level (depending upon variables) - Site #7 had 157 aphids/25 - 180° sweeps while site #17 had 203 aphids/25-180° sweeps. All but 4 sites had aphids present in pea aphid pan traps (76% of field sites had aphids present). The most abundant site was site #9 with a total of 4 alate pea aphids. ELISA plates are being read again for the 3rd time. DAS-ELISA (double antibody sandwich enzyme-linked immunosorbent assay) tests of plant samples taken from each field have been analyzed. Plant samples taken: 10 June 2016; 3 transects/site; 10 plants/transect; 16 total sites (1 site emerged as a wheat field [site was kept anyway] = site #4); 48 total samples; Plates read at 405 nm (wavelength) on 16 June 2016. Overall - 50% of fields tested were positive for PEMV, BLRV or Both viruses. Only 1 northern site (#3) tested positive for either virus, in this case BLRV and only 1 transect out of the 3 (33% virus incidence) was positive for that virus. All other sites that tested positive for BLRV/PEMV were located south of Moscow. Sites south and west of Moscow had the highest virus presence and incidence: sites #7, 8, 9, 10 and 12 tested positive for PEMV with a high incidence (14 out of 15 transects tested positive, 93% virus incidence). Sites south and east of Moscow: #16 and 17 tested positive for BLRV, PEMV or both (at a relatively low virus incidence, 33% and 66%, respectively). The cutoff date for treatment of alate viruliferous pea aphids (from UI data) shows that spraying before 32.49 DAE would be economical in preventing yield loss (quite early in the growing season). After looking at the fields today I believe all pea fields are past this cutoff date and thus virus damage to yield should be negligible this year. Secondary virus spread could be happening right now as I type this. Aphids collected today (17 June 2016) have been sent south for PCR analyses. If you'd like more information about our DAS-ELISA results please contact Brad Stokes (bstokes@uidaho.edu). Our plant samples were processed for ELISA (enzyme-linked immunosorbent assay) and we should know the results by the end of the day. This should give us an overall picture of which viruses are present and in which localities (samples were taken from each site in our Aphid Tracker pan trap network). Our first virus testing results indicated only one location had a viruliferous pea aphid (positive for PEMV) at one site (site #8) for the 8th of April. Dr. James Woodhall has processed two dates so far (8 April & 13 April). Aphid testing will continue until we are caught up with the current immigrating aphids. Fewer aphids this week (compared to last week). We found alate pea aphids at sites # 1, 5, 6, 7, 9, 11, 12 and 13. A total of only 15 aphids were captured (and are being sent for virus testing). Site #9 had the most aphids with a total of 7 alate pea aphids. Several sites had aphids (13 out of 17 had aphids present in traps) and other sites had a higher number of alate pea aphids (notably sites # 8, 9 and 10). Pea aphids are being sent down to Parma for virus testing. ELISA plant samples will be taken next week! Enjoy your weekend! Very few alate pea aphids were found in traps, only 4 total aphids at two sites (site #'s 9 and 12). Site #6 was infested with alate and apterous pea aphids. Be sure to check your fields over the weekend for infestations. Have a GREAT WEEKEND! Aphids are being sent south for virus testing. Yesterday (16 May) was an impromptu collection day, we collected a total of 8 aphids across 7 sites (site #'s: 1, 3, 5, 7, 10, 14 and 17). Alate pea aphids are coming into the pea fields in the Palouse - be sure to monitor for aphid presence/absence in your particular field. Aphids will be sent to our virology lab for virus testing on Friday! We will collect again on 20 May. Just got done with the Aphid Tracker Pea Aphid Pan Trap Network, found a total of 14 aphids at 8 of our sites (sites with aphids: 4, 7, 8, 9, 11, 12, 13, 14). Let's hope the cool wet Sunday weather kills off these immigrating pea aphid populations. Aphids will be sent to our virologist today, results to follow! We checked traps this past Sunday (8 May) and found our first alate pea aphids of the season, please see the map of where we found aphids so far. A total of 8 alate pea aphids will be sent to the laboratory for virus testing. All aphids were found in the southern reaches of our trap network. Aphid Tracker will be setting out traps early this year, traps should be in on April 29th with our first data collection happening on May 6th. We're getting excited! Aphid pan trap sites were collected today. Aphid numbers are continuing to dwindle to near zero as the plants dry down and no aphids are immigrating from the Columbia Valley. Hope you had a great 4th of July! Next week will be our last collection. Sites T4, T6, T8, T10, T11 and T3 were taken out today. Aphid pan trap sites were collected today, aphid numbers were the lowest they have been all year. Our three highest aphid trap sites were T12, T14 and T3. Plant samples tested for virus (using ELISA) showed that 30% of fields are testing positive, be on the lookout for symptomatic plants. Aphid pan trap sites were collected today instead of the normal Friday routine. The three highes sites were T12, T14 (again) and T5. Aphid PCR results and plant ELISA results should be in soon so keep on checking. Fields seem to have high aphid numbers right now. Pan trap sites were just collected and dropped off for virus testing. The three highest aphid numbers were found at T12, T14 and T4. We also sampled each of our sites for plant samples, these will be run using ELISA (enzyme-linked immunosorbent assay) to see if virus is present within the crop. Visible symptoms seemed to be in nearly all of our sites. Have a great weekend! We have picked up a virus signal from the first collection (May 22nd). PEMV was found at two of our pan trap sites, site #6 and site #9. Be on the lookout for plants exhibiting virus symptoms. We will take plant samples for ELISA testing on Friday. Aphid pan traps were just collected and turned in for PCR processing to see if aphids are carrying virus (BLRV & PEMV). Next Friday (June 19th) we will be taking plant samples for ELISA to check for the presence of virus in fields around the Palouse. Have a great weekend! Aphid pan traps were collected on June 5th, we are still seeing quite a bit of alate pea aphids coming into the area. We are waiting on PCR results to confirm whether or not these aphids are carrying any virus (PEMV/BLRV). Should have results soon! Aphid pan traps were collected again today, please check out our 2015 map and see the data for yourself! A total of 65 alate pea aphids were trapped and were just dropped off for virus testing. Virus results should be available early next week. Best wishes to all of you pea growers!!! Aphid pan traps went out on May 18th this year and were collected for the first time on May 22nd. We collected a total of 63 aphids over our 14 trap sites. Pea aphids are now being ground up for virus testing. Wishing all of you good luck this season, be on the lookout for pea aphids. Aphid pan traps were taken out yesterday. Hope harvest goes well for all the Palouse growers around the area! Aphid numbers were very similar to last week, they should continue to dwindle as the season gets closer to harvest. Have a great weekend! ELISA tests were just completed. No field site tested positive for BLRV, the following fields tested positive for PEMV: Sites 5, 7, 8, 11, 13. We will check fields Friday for incoming aphids and begin taking out traps as the fields dry. Have a great week and see you Friday! ELISA (enzyme linked immunosorbent assay) has not been able to find any Aphid Tracker Sites with BLRV, though so far one site (Site #15) has tested positive for PEMV. Traps will be checked today as well as plant tissue collecting for virus testing over the weekend. Aphid numbers are starting to decrease currently, but keep an eye out on your particular level of infestation. Have a wonderful weekend! Just checked all aphid traps, except for site #4. Sites #6, #9 and #13 had high numbers of pea aphids. Sites will be checked again on July 2nd. Have a great weekend! Aphid pan traps are continuing to be collected and posted to our 2014 map locations. The "hot spots" in the Palouse region continue to be sites #9 and #6. Next week we will be collecting plant samples at each location for virus testing using the ELISA (Enzyme-Linked Immunosorbent Assay) technique. Pea aphid traps are currently collecting pea aphids at all sites. The "hot spots" so far have been sites #9 and #6, collecting a total of 171 aphids so far this year. We will continue to collect aphids each and every Friday. Next Friday (June 20th) we will be collecting plant samples for ELISA virus testing to see if PEMV/BLRV/PeSV are on the Palouse. Pea aphid pan traps are set up in the Palouse growing region. Trap locations for this season can be found on the 2014 aphid/virus tracker map. Traps range from just north of Palouse, Wa to just north of Lewiston, ID with much of the traps along the breaks near the Snake River. We have already found aphids on peas this year at every location, except location #13. It is also important to note that our virus risk forecasting model predicted a high aphid/virus number (3 out of 4) for this season. 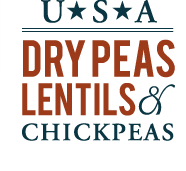 Thanks to Jerry Mraz, Jacob Gisler & Mike Devoe for help finding pan trap locations and we would especially like to thank the pea/lentil/garbanzo producers for their cooperation. Good luck this growing season! The newest calculator is up and running on the site. It is designated for lentil growers experiencing non-viruliferous aphid populations at or near the late (reproductive) growth stages. Thanks to Sunil Paudel for all his hard work. This was the last day of aphid pan traps, all pan traps have been removed from their respective locations. ELISA results returned yesterday (August 1st) with no fields testing positive for either PEMV or BLRV. We would like to thank ALL cooperating growers for letting us put in and maintain traps and a special thanks to Jerry Mraz for all of his support. The pan traps have still been collecting pea aphids, though numbers were low last Friday. All data has been added to the 2013 aphid tracker map. ELISA results will be posted by the end of this week. Good luck with harvesting in the upcoming weeks!!! The pan traps have been continually collecting pea aphids. All data has been entered into the 2013 virus tracker map. The second round of ELISA tests will be finished this week and results will be posted as soon as possible. The pan traps are continuing to collect pea aphids. We have pulled traps at a couple locations to make harvesting easier. Virus symptoms seem to be VERY LOW this year (so far), we will conduct another set of ELISA tests to check for virus presence this Thursday (July 11th). Data is continuing to be posted to the aphid/virus map for this season. If you notice any virus symptoms please feel free to contact us. The pan traps collected 7 pea aphids last Friday (June 14th) at three sites. Data has been posted to the aphid/virus map for 2013. ELISA results came back today. None of the fields tested came back positive for PEMV or BLRV, in addition no visual symptoms of either virus have been readily observed by our team. Virus risk seems lower than normal so far this season. Pan trap results will be posted tomorrow afternoon. The pan traps collected 16 aphids on June 7th. Plant sample surveys are being run via ELISA and results should be posted very soon. The pan traps collected 6 pea aphids on May 31st. Plant sample surveys were completed this morning and will be rushed through ELISA testing to determine virus presence and incidence within fields. The testing should be completed by Thursday, June 13th. Results will be posted immediately to the website and the 2013 map. We will be doing a plant sample survey in the next couple days to test plants for viruses via ELISA (enzyme-linked immunosorbent assay) tests. The pan traps have collected 34 pea aphids across the trap network since deployment (May 17th). The 2013 map is on the website and data is being updated continually. ELISA tests will be posted as soon as they are processed. Aphid pan trap data will be entered every Friday afternoon. Pea aphid pan traps were deployed this morning in various field locations across the Palouse. We will begin collecting data next Friday. We will also be providing weekly updates on pea aphid abundance for our trap locations. The map will soon be updated for the 2013-growing season with all the trap locations as well as the data. The virus risk forecast will also be completed early next week and will be integrated into the calculators as soon as possible. Special thanks to Jerry Mraz for helping us find locations for pan traps. We would also like to thank all the cooperating growers. Best wishes for the upcoming growing season! We completed surveys at 27 field sites for visual symptoms of virus. Each evaluator walked a 100 meter transect and surveyed 50 plants every 10 meters for a total of 500 plants per transect, 3 transects per field, 1500 plants per field surveyed. The percentage of symptomatic plants ranged from 0.1% to 34%. There is a south to north pattern, with higher percentages of symptomatic plants tending to occur in southern areas and lower percentages in the north. A figure representing these data will be prepared soon. The higher percentages are expected to be associated with yield losses, based on prior years' data. We are continuing to monitor but have no additional information to report at this point. We will be conducting an areawide systematic sampling for virus symptoms next week, and a second sample of plant tissue for presence of virus soon thereafter. Maps of the approximate locations of fields testing positive for virus PEMV and BLVR can be viewed by clicking these links. The maps show the minimum percentage of infected plants in each location sampled. This is because the plants were pooled into sets for virus detection rather than sampled individually. PM: Laboratory tests have been completed on plant tissue samples from all 34 sites in the survey. Nearly all sites were positive for virus in at least one plant (3%) of plants sampled. This is a higher incidence of virus at this point in the season than we have observed since starting our surveys in 2006. The prevalence of virus-positive plants varies among sites and we will be posting that information to the Aphidtracker by tomorrow. AM: Unusually high infestations of aphids are being observed in the southern stretches of our study window, and specifically along the Rimrock road corridor. We are expecting data on the presence of virus imminently. We think producers across the region should proceed as though the disease risk is proportionately higher this year due to these infestation levels. ELISA results on the presence of virus particles in the plants from a survey of producer fields taken last week will be posted soon to this site. We are now observing high densities of aphids in the crop, primarily in the southern stretches (Almota south along the breaks appox 20 miles), the usual hotspots. The Columbia Basin had unusually high numbers of aphids this year in our surveys there in April. All of the traps have been deployed and we are collecting and testing aphids. The first aphid collections were made on June 4. Aphid abundance in the traps across the region are close to the average values for this time of year. The aphid sampling season will be starting soon. This week we will visit the Columbia Basin to survey alfalfa fields and other sources. In early May the traps will be deployed and we will begin entering the data into the 2012 map. We will let you know as soon as this is posted. Meanwhile, we have finalized our three calculators and posted them to this site (go to home page and click on Decision Support System for Managing Aphids & Viruses where you will find links to each one). The first calculator helps you decide on treatments for your pea seed. The second one helps you make decisions about whether to spray your fields early for aphid. The third one calculates and Economic Injury Level for aphids pre-bloom. All of these have been developed based on our research data collected during the LVP. If questions arise in using these, please let us know! (July 30th - Aug 15th) The aphid sampling season has ended. We pulled the traps last week. Plants sampled during the disease scoring procedure were tested for virus using ELISA. We detected PEMV in 11 plants out of 225 plants tested and BLRV in 5 of 90 plants tested. These levels are consistent with the relatively low levels of disease observed this year. (July 22nd - July 29th) Pea fields in the south are beginning to dry down. This week we conducted a visual survey for virus symptoms, and we collected tissue for virus detection. Three 100-meter transects were taken from each of 32 fields. Symptoms were observed in 8 of the 32 fields sampled (0.25). Of those eight fields, 3 had approximately 3% symptomatic plants, 2 fields had 5-10% symptomatic plants and 3 fields had approximately 25% symptomatic plants. The commercial fields with the highest rates are located in areas where virus symptoms have been observed in previous years: near Almota and Albion WA. PEMV was detected in fields near Albion and Almota. BLRV was detected near Pullman Washington, Genesee Idaho and in one field near Oaksdale, Washington. In all of these fields, 10% of the plants in each of these fields tested positive for the respective viruses. (July 7th - July 21st) Aphid densities region wide are lower than what we have seen in years past at this stage in the season. We have begun to see visual symptoms of virus in some locations. Prevalence is lower than in the previous two years. In the southern parts of the region there are some fields with symptoms evident, but at low rates (1 to 3% of plants in affected fields). We will be taking a survey next week of visual symptoms to quantify this region wide. (June 30th - July 7th) We continue to see no visual symptoms of virus. Aphid populations remain low to moderate on average. Recall that in 2009 and 2010, both years in which some fields developed symptoms and there were reported yield losses (southern parts of the region only), those symptoms were not observed until July. Based on this it is too early to declare that the risk of virus infection has passed for this year. Surveys continue. (June 23rd - June 30th) Aphid clones are being observed within the crop, which is normal for this time in the season. The highest densities have been observed in a few fields in the southern part of the study region near the "breaks". Many fields are still only up 3-5 nodes, though fields in the south are further along relative to the whole region. The first field census has been completed and plant tissue samples are being tested for the presence of virus, the results of those tests will be posted as they are completed. While collecting the census samples virtually no visual symptoms were observed in fields. With the temperature finally reaching sustained warmer ranges, we expect in the next ten days the aphid populations will begin in earnest to take off. Although the season has been delayed due to the cold weather, we began detecting pea aphid soon after setting out our traps this year in late May. As in previous years aphids have appeared first in the southern part of the region. Overall numbers are lower than in previous years and continue to be relatively low. No virus has been detected. We will be holding a workshop for those interested in participating in a "beta" test of the Epicollect system that will allow growers to submit their observations of pea aphids and virus using smartphones. The data will be posted to maps that can allow everyone to see where aphids are in real time. 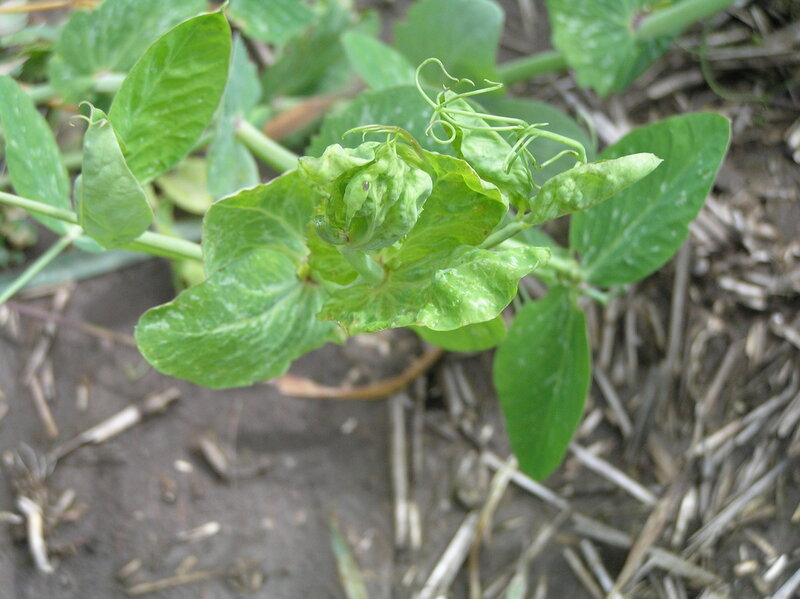 Virus symptoms report: This year, legume virus symptoms were first observed in the week of June 7 in pea fields near Almota, Albion and Uniontown, Washington. We also collected aphids carrying virus in traps in the same area relatively early in the season. Virus symptoms appeared later in fields near Genesee, Idaho, but have been essentially absent from fields in the northern part of the region. Last week, Lyndon Porter discovered virus symptoms in most of the 12 fields he sampled from Colfax to Moscow/Pullman. Two of the fields Lyndon scouted were severely injured. Jerry Mraz (PNW, Genesee) reports (June 20) that some symptoms are present in most of the fields he is scouting in his part of the region. In the north, Ken Fuchs (Co-Ag) reports (June 20) the crop looks mostly virus free except for rare, isolated plants. So the north-south differential observed in previous years seems to be holding. This week (June 19-20), we conducted a systematic visual survey for virus symptoms in pea fields at sites across the region where we have been trapping aphids this season. In each field, plants were sampled along two 100-meter transects. Along each transect, 50 plants were examined for symptoms every ten meters, for a total of 500 plants per transect. We sampled along two transects for a total of 1000 plants per field. We found the proportion of plants showing symptoms ranged from zero to 80% (Fig. 1) (all were pea fields except those indicated as lentil). As in prior years of our study, virus disease prevalence and percent infection is greater in the southern part than in the northern part of the region. Nonetheless, there are exceptions indicating local factors can override the drivers of this geographic trend. The symptoms we have seen this year (Figs. 2 and 3) are the distortion and windowing consistent with Pea enation mosaic virus, but our lab tests indicate Bean leaf roll virus is also present. Most fields only have symptoms in the upper nodes of affected plants so that the effects on yield this late in the season are uncertain. Where symptoms are more extensive, a yield impact is likely. Aphid immigration patterns: It appears 2010 will be scored a “1” (low to moderate) on the “Clement” Index. This is because the cool and rainy June reduced aphid population growth and movement, although populations are now high in untreated fields. The source of virus inoculum this year remains uncertain since infectious aphids were rare in June. The warm spell in April could have brought in some undetected virus inoculum. You can help: We would like to take advantage of the variability this year to measure the impacts of virus disease on pea yield. If you have symptoms like those shown in one of your fields and might be able to provide data on yield specific to that field, please let us know (sanforde@uidaho. edu). We would like to work with you. We continue to see virus symptoms in certain fields in the southern part of the region, notably near Uniontown, Colfax and Genesee. We have reports, from Lyndon Porter who was scouting for fungal disease last week, that some virus symptoms (Pea enation mosaic) can be found in most fields from Colfax to Moscow/Pullman. Two of the fields scouted by Lyndon were severely injured. Jerry Mraz (PNW, Genesee) reports that some symptoms are present in most of the fields he is scouting. The degree of possible injury varies but is often confined to distortion of the uppermost pods and leaves. This late in the season it is difficult to know how much of an effect this could have on yield. Our surveys up north continue to find symptoms infrequently. Ken Fuchs (Co-Ag) also reports the crop looks virus free in the northern parts of the region except for rare, isolated plants. So the north-south differential observed in previous years is holding. We are completing a full symptom survey of all the trap sites north and south, today. We will have these results soon. A report will appear in the Pulse Pipeline this week. Aphid numbers in traps are coming up across the region. Testing these aphids for presence of viruses is under way. Based on our surveys, virus symptoms in the crop remain confined to sites in the southern part of the region. For jpg photographs of representative symptoms observed near Site 17 click here (sympt1, sympt2, sympt3). Plants and aphids from the southern part of the region have tested positive for Bean leaf roll virus. Suspected positives for PEMV are being retested. Aphids collected from sites 17 and 22 on June 3 are positive for BLRV. We have begun seeing virus symptoms in pea fields. Plants visually symptomatic for PEMV were observed TODAY in pea fields near Almota and Albion WA. Plant tissue samples have been collected for analysis. Fields at all of our sites north of Albion were examined and no symptoms were found, but plant samples were taken. Tomorrow, sites to the south will be examined and the results reported here. The aphid traps for the season were installed on May 18 and collections began on May 24. View the trapping Locations and Data. In summary, we picked up one aphid in our reliable first detector site near Almota on May 24. May 27 we collected no aphids. This week we have picked up a few aphids from traps near Colton and Uniontown, despite the recent run of rainy weather. We have also been sweeping pea fields at each of the sites. Some sites near Uniontown had aphids (winged and wingless) in the crop. This week we detected some in peas near Albion. Otherwise, the crop has been free of aphids throughout the region. Testing for virus in aphids from traps and sweep samples is underway and results will be communicated ASAP to this site. Next week, we will be collecting plant tissue from pea fields adjacent to all of the trap sites and testing this tissue for viruses. We will use 3 100-meter transects into each field, collecting 30 plants and looking for symptoms. If you are hosting traps and do not want us in the field to take the samples for whatever reason, please let us know by following the "Feedback" link on the side bar. Grower Advisory Group Meeting ahead of the 2010 season. Workshop on the Legume Virus Project at the Harvester Restaurant in Spangle, WA. Sanford Eigenbrode, Damon Husebye and Bhadra Murthy presenting, 8:00 to 10:00 a.m. The LVP personnel met for a 2-day retreat at the University of Idaho to set plans for the 2010 season. Trap locations will be determined soon. The Columbia Basin trip in April will go further west to seek PEMV sources, and will explore close to home along river canyons. Those interested in hosting traps should contact us, by emailing sanforde@uidaho.edu. Surveys of the region were conducted during the week of July 22. Plant samples collected from commercial fields were subjected to ELISA for detection of PEMV and BLRV. In addition, fields were surveyed for occurrence of virus symptoms. These data have been mapped and posted to this web site. In summary, BLRV and PEMV are detectable using ELISA, with a greater proportion of sites positive for virus in the southern part of the region than in the northern part. BLRV occurs throughout the region, while PEMV only in the southern part. Virus symptoms occur in more fields and in greater proportions of plants in fields in the southern part of the region. To see these maps, click here or on 2009 "Locations" in this side bar. A special workshop on virus symptoms in pea was held at the UI Plant Science Farm. An experiment under way there allowed participants to view pea plants with a range of symptoms caused by PEMV and BLRV. Plants had been inoculated for various periods of time in the field with both of these viruses. Virus disease symptoms typical for PEMV have been observed in fields as far north as Oaksdale. In the northern sections, however, the incidence within field is low and many fields appear to be symptom free north of Palouse WA. In some fields to the south the proportion of infected plants can exceed 20%. We are continuing to monitor the situation and are working to confirm PEMV as the causal agent. Although some reports of injury in garbanzo beans have been received, on inspection it is not clear these are caused by virus. This is being studied. Virus disease symptoms, sometimes severe and prevalent are now being observed in peas and garbanzo beans in the southern part of the region. Prevalence and severity are high enough in some fields to potentially cause yield losses. Review of samples from early in the season is underway, but preliminary results indicate few trapped aphids were carrying the virus. Virus disease symptoms have been observed in several fields in the southern part of the Palouse. We are collecting tissue from fields throughout the region and will be reporting results to this site within a few days. Virus disease symptoms and positive identification of presence of PEMV (by PCR) have been observed in one pea field near Almota WA. The crop is nearing maturity but symptoms including enations on foliage and distortions on pods are evident. Please stay tuned for additional information about this location and others during the next two days. Aphid numbers continue to be moderate with negligible occurrence of virus in immigrating winged aphids. Disease symptoms have not been observed in the crops. 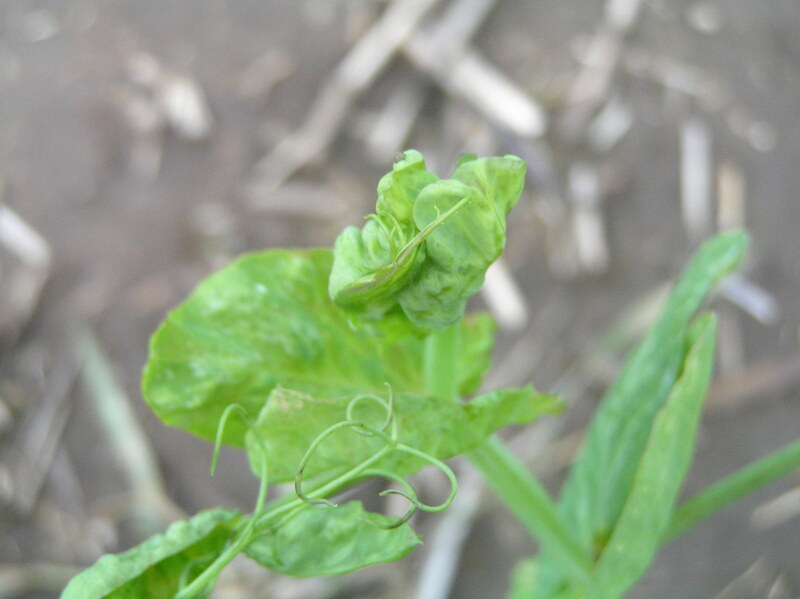 During the coming week we will be collecting plant tissue from pea and lentil fields to assess presence of virus. Aphid numbers collected in traps and encountered in pea fields are greater this year than in 2007 and 2008, but still relatively low. The early build up in May was depressed, evidently by the cool and wet weather in early June. We have only detected virus at one site thus far. That site appears to have BLRV and PEMV in the aphids collected. No disease symptoms are apparent in any sampled fields this year. Presentation. Sanford will make a short report on this season's aphids to the SPRING CROP INSECT UPDATE, hosted by Larry Smith in Lewiston ID (AM - Brammer Building 1225 Idaho Street). Trap sites have been set for 2009. Data on aphids collected from May 19 through May 26 have been posted as maps to the 2009 "movie". In summary, numbers of aphids trapped are greater than in the prior two years; more aphids are being collected from southern locations at this stage in the season. PCR tests have not detected virus in any incoming aphids this season. Traps in the basin. (Walla Walla, Touchet) for the week of April 20, these traps were free of pea aphids. Traps in the Palouse region. We have begun to set traps in the Palouse for the 2009 season. Although only a few growers have been able to plant pea or lentil, we will begin collecting aphids on May 15, as in prior years. We will have approximately 35 sites and these will be located on the map soon. Thanks to Ken Fuchs (CoAg) and Mike Devoe (Genesee Union) for their help in locating the trap sites this year. Columbia Basin. We made our annual foray into the Basin on April 17-19 this year. Despite the cool season, aphids were located in alfalfa in 13 of 27 sites surveyed. Abundance was low (about 0.1 aphids per sweep). Thanks to help from McGregor's field men, especially Marshall McKinleye we located traps in Walla Walla, Touchet and Dayton. Traps. We are just beginning to determine positions for traps for this season. With the new funding, we will be placing more traps than in previous years. If you are interested in having a trap located near one of your fields, please contact us. No pea aphids are detectable in the region. Alfalfa fields in the Columbia Basin are dormant. Inspections are just beginning this week to determine status of overwintering aphids near Prosser. The season continued to be a low aphid year. There was no evidence of virus disease or presence of viruses in the 30 field sites the team sampled in July. Pea aphid counts began to increase in late June, but overall remained low. Sampling is being concluded this week and traps will be removed. Virus incidence in aphids has been extremely low. Virus symptoms have not been observed in sampled fields. A few plants appear symptomatic in Spillman Research Farm this week, and these will be tested for virus this week. Overall, based on these data, risk of virus disease in the Palouse appears to be virtually nil. Pea aphid counts are rising slowly in the traps. The very first aphid to test positive for virus (PEMV) occurred in the Albion area in the 16 June sample. Pea aphids are increasing slightly, to about 3-4 per sweep in many locations. Virus has been detected in two aphids collected from alfalfa fields in the Palouse, but so far not in any pea fields sampled. Pea aphids remain at very low levels in the traps. We have yet to detect virus in any trapped aphids. We have detected PEMV in just one aphid collected from alfalfa. Based on the similarities in aphid and virus incidence this year and last, it appears that 2008 will be very low risk of virus in pea and lentil on the Palouse. We plan to continue monitoring aphids in the traps and in the fields until the second week of July. Data will be updated as we do so. Pea aphids are beginning to arrive in the trap network (see This Year 2008 Locations). The numbers per trap are about 1/2 of what they were at this date in 2007, due evidently to the continuing cool and wet weather in the region. So far we have not detected virus in any of the aphids collected. Sweep net samples at 25 sites (all those shown on the Locations map), have collected no or few aphids at many sites. Maximum numbers observed are 1 aphid per sweep. The project will receive a boost in the form of a generous grant from the USDA-CSREES RAMP (Risk Assessment and Mediation Program). This grant will arrive in the fall of 2008 and allow us to continue to develop the risk forecasting system. It also includes funding to improve aphid management decision making, assess methods for pea aphid control and accelerate breeding efforts to provide virus-resistant varieties for the Palouse and elsewhere. A full description of the objectives of this proposal is forthcoming. We will be holding meetings with producers to seek input and report on the activities of this project.